BEIJING (Reuters) – Growth in China’s factory sector likely cooled further in October as domestic demand faltered and exporters felt a bigger sting from an intensifying trade war with the United States, a Reuters poll showed. The official manufacturing Purchasing Managers’ Index (PMI) is expected to have slipped to 50.6, the lowest since February and down from 50.8 in September, according to the median forecast of 34 economists in a Reuters poll. The 50-mark divides expansion from contraction on a monthly basis. 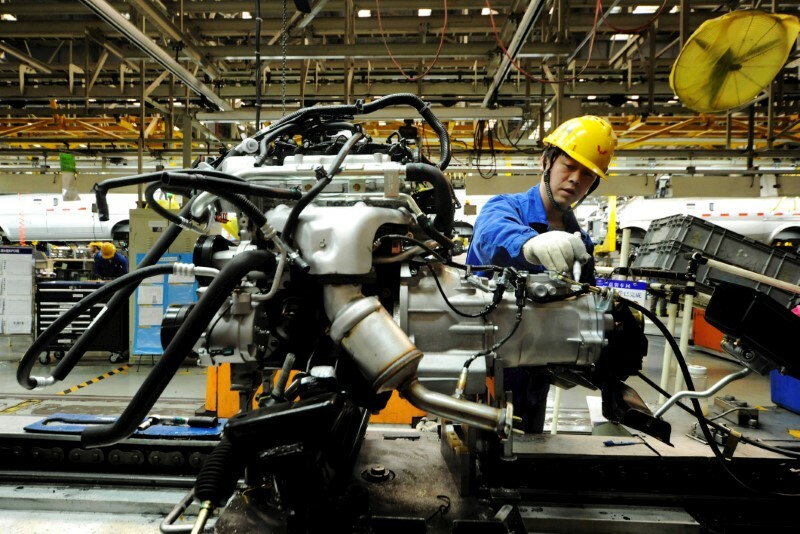 Separately, a private survey on China’s manufacturing sector is forecast to show activity contracted for the first time since May 2017, though the decline may be marginal. Such downbeat readings would signal a further loss of momentum in the world’s second-largest economy, adding to worries about risks to global growth, and would likely prompt Beijing to launch more support and stimulus measures on top of a raft of initiatives in recent months. The economy grew by a slower-than-expected 6.5 percent in the third quarter, its weakest pace since the global financial crisis, and analysts believe business conditions will get worse before they get better. October is the first full month after the latest U.S. tariffs went into effect. Washington and Beijing slapped additional tariffs on each other’s goods on Sept. 24. If the United States follows through on its promise to increase its tariffs to 25 percent at the turn of the year, exporters will feel more pain, Chinese businesspeople say. “Export orders that I received from October’s Canton Fair have been down drastically,” Lu Junwen, general manager at a battery maker in Shenzhen, told Reuters. The Canton Fair, held twice a year, is China’s biggest trade fair. “Next year is going to be hard,” Lu said. fixed-asset investment growth from record lows and raise the specter of major layoffs which would weigh further on consumption. Earlier this month, the central bank cut the amount of cash that banks must hold as reserves for the fourth time this year, stepping up moves to lower financing costs and pledged more support to private firms, a key source of jobs. Beijing has also urged banks to continue lending to struggling firms, especially smaller companies, though rising defaults are making lenders cautious about extending credit to businesses without state backing. Economists expect Beijing will roll out more support measures in coming months, with more cuts in banks’ reserve requirement ratio expected next year, a Reuters poll showed this month. Hefty tax cuts also look to be on the cards, though that would only ease pressure on firms’ bottom lines and could not compensate for slowing sales. “We expect the Chinese government to continue to roll out stimulus measures that match the weakness in the economy. This should help ensure a soft landing next year,” economists at Bank of America Merrill Lynch (NYSE:) said in a client note on Friday. They expect gross domestic product (GDP) growth to slow to 6.1 percent next year. The Chinese government has maintained it can still meet its growth target of around 6.5 percent this year, slowing from 6.9 percent in 2017. The private Caixin/Markit Manufacturing Purchasing Managers’ index (PMI), which focuses more on small and mid-sized firms, is expected to have dipped slightly to 49.9 from 50.0 in September, putting it a whisker within contraction territory. The official PMI survey is due out on Oct. 31, along with a similar official survey on services. The private Caixin manufacturing PMI will come out on Nov. 1 and its services PMI will be published on Nov. 5.